Okinawa is a paradise for outdoor sports enthusiasts. The island's pristine ocean provides a fabulous playground for divers and kayakers, while its mountains and rivers serve as a haven for mountain bikers and hikers. Sky sport "adventurists" also take advantage of Okinawa's beautiful nature with unobstructed views of blue and green from high above. 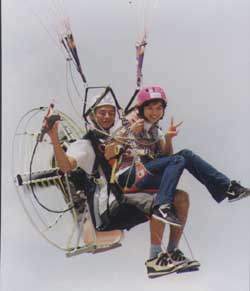 Those with a passion for enjoying many of today's outdoor adventure sports should pay a visit to Nago's 21st Century Beach Park on July 10 and 11 for the first annual "Motor Paraglider Festival." The event, which is being planned and organized by Blue Sky, a local sky sports club, in conjunction with Extreme Promotion Service, promises to be both fun and exciting. The festival will focus on motorized paragliding skills through a variety of tournament style games. Points will be awarded for landings within set zones and control during maneuvering. Some of the games feature dropping items into selected targets from the air and kicking over plastic bottles while coming in for a landing. Competitors will also test their technical ability during a slalom course. Sky sports, which also includes hang gliding, sky diving, and ultra-light aircraft, has been thrilling Japanese for decades. Okinawa's clear skies and fantastic aerial views of the ocean below have made it one of the top places in Japan to enjoy the feeling of flying. "Frank" Ashimine, the president of Blue Sky, explained that Okinawa's warm weather makes it the perfect area to practice all year round. "Our club gets together whenever the weather is good," said Ashimine. The sport offers a very unique experience for beginners and is also technically challenging for experienced flyers. Despite its image as being difficult and dangerous, sky sports is something that anyone can quickly learn. "It's very fun and it's also safe and simple to do," commented Ashimine. Anyone interested in paragliding can get a feel for the sport through a simulation exercise set up at the festival. Organizers will also be raffling off free rides into the air with a qualified instructor during both days, providing an experience of a lifetime for those lucky winners. The location of the "Motor Paraglider Festival" will make a perfect day for the whole family. The swimming beach is great for kids and the park is also nicely landscaped. Visitors can enjoy watching the colorful acrobatics from the ground and also learn more about the sport as they enjoy the park's relaxed atmosphere. Even if you never plan to paraglide in your lifetime, you may want to check out the action this Saturday and Sunday at Nago. For more information call Frank at 862-3536.